Foot Friend cushion, 18" x 8" x 11". 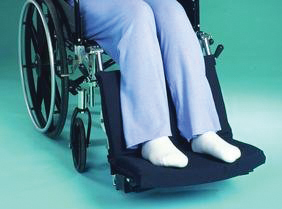 Relax your feet in comfort while sitting in your wheelchair. This padded foot rests both your fee and calves for added comfort. Cushion easily attaches with hook and loop straps. Cushion easily attaches with hook and loop straps. Butterfly Pillow 22" x 18"